Time for the weekend! High-fives all around. You guys know how to get the weekend started right? Beautiful polishes, of course! And boy-oh-boy do I have some amazing polishes to share with you all. 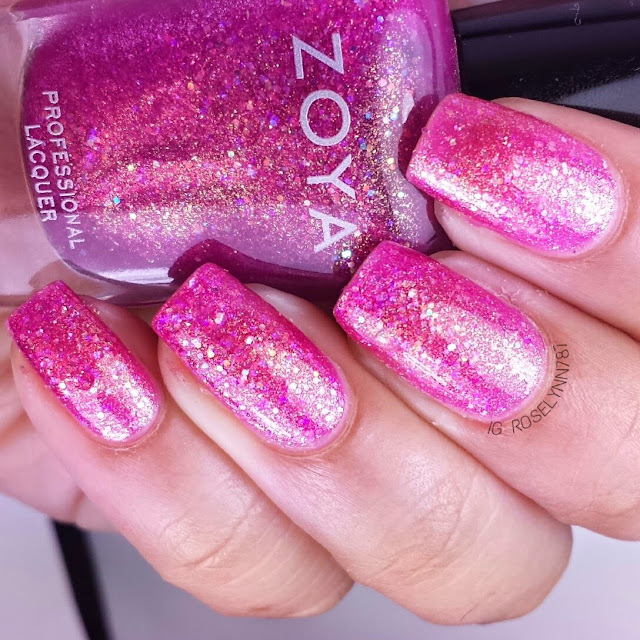 If you saw a couple days ago I showed you guys a preview post of one of the new collections Zoya is releasing for the summer season. 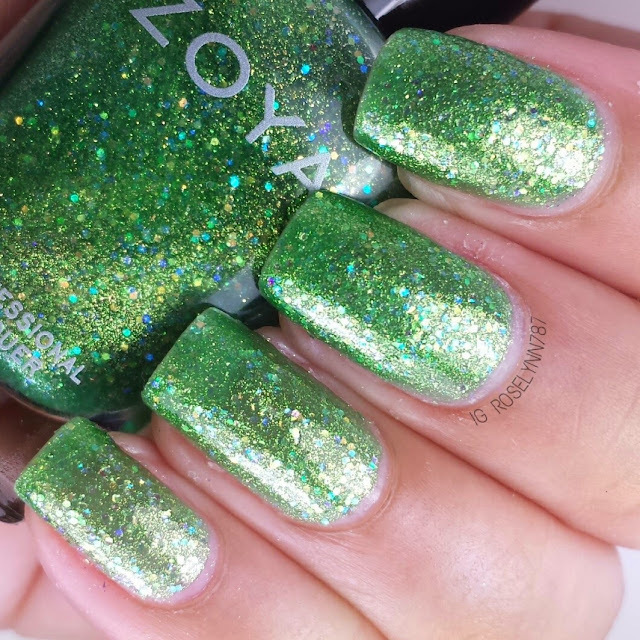 Today I have swatch photos and will be reviewing the six polishes that make up the Bubbly Collection for Zoya 2014. Muse is a raspberry blue holographic polish infused with subtle flakes of gold. 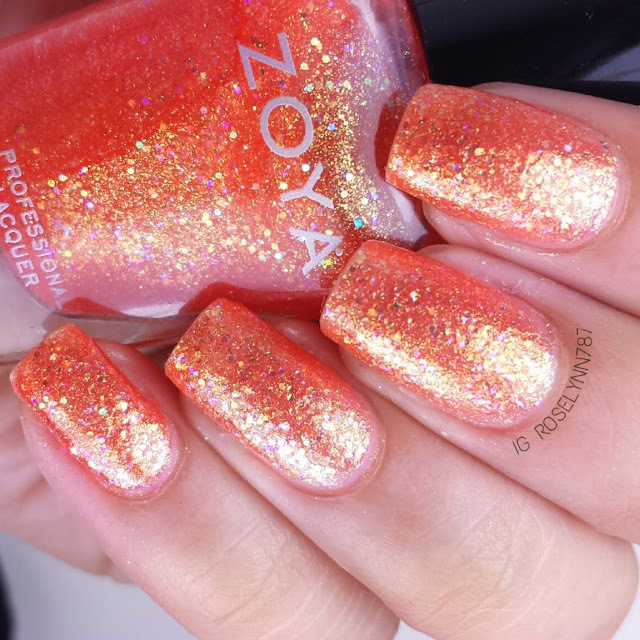 The whole basis for this collection is summer and this polish is a great way to embrace the heat. It's absolutely beautiful and very brightly colored. Best part? The intense pigment does not stain! 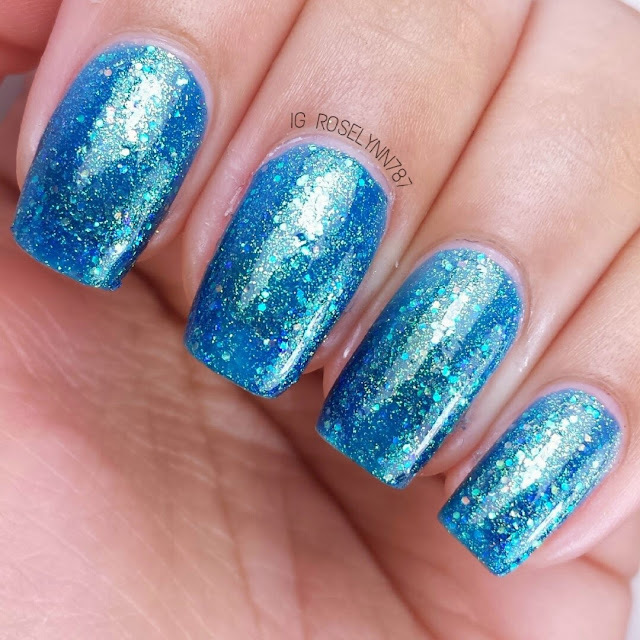 Swatched over a clear base, used three thin coats, and sealed with a fast-drying topcoat. Sheer in one coat, I found that three was just the amount I needed for full opacity. Formula was excellent. I will admit I was a bit hesitate when first applying it but each layer went on very smoothly. Binx is a feisty orchard purple polish filled with holographic golden flakes. 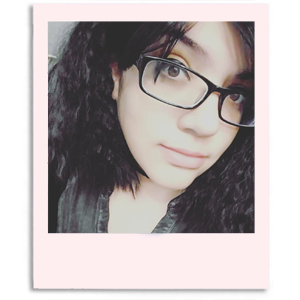 On my skin color and in these photos, the color resembles more towards pink in purple. However, in person this beauty is definitely a lot more purple-colored. Swatched over a clear base coat, used three thin coats, and sealed with a fast-drying topcoat. Formula very smooth and easy to apply. Sheer in one coat, but full opacity can be achieved with three thin coats. Thin coats are important as you don't want to cause clumps or build-up. 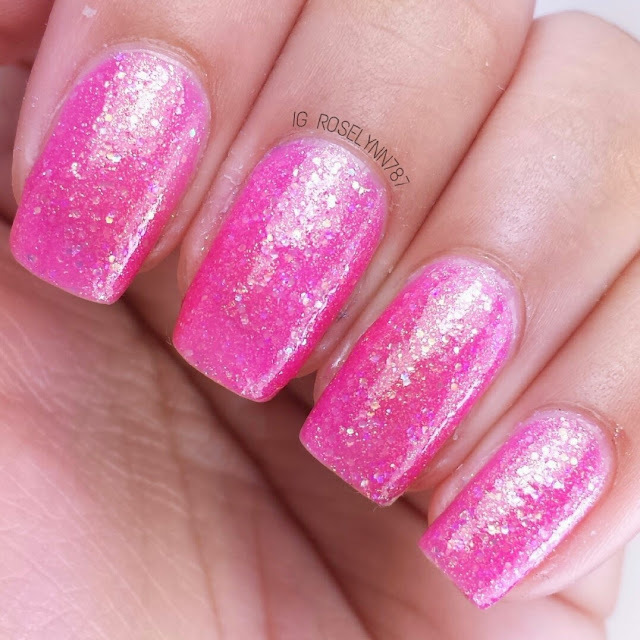 Harper is beautiful bright pink holographic polish filled with gold shimmer. 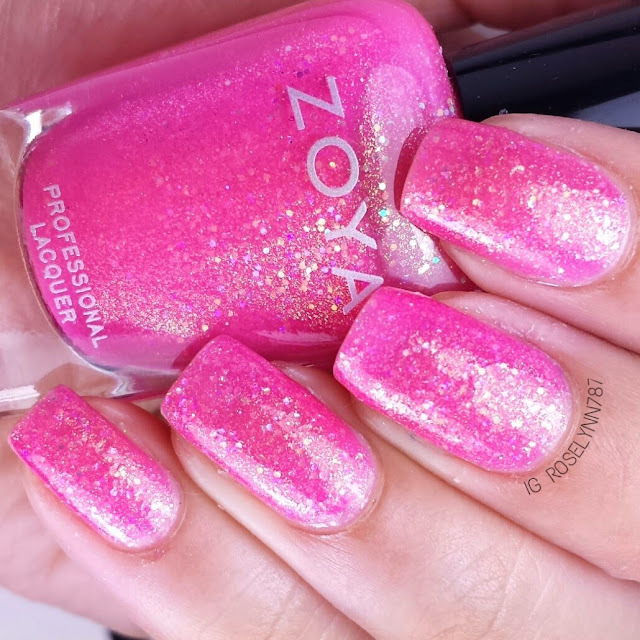 As I've said many times before, what's a summer collection without some popping pink. I love how the gold shimmer makes this so vivid. Girly and fun, Harper is definitely a must-have addition to any collection. Swatched over a clear base coat, used three thin coats, and sealed with a fast-drying topcoat. Sheer in one coat, but you can get away with two being opaque. I added the third layer for good measure and best coverage. I didn't have to wait between layers to keep applying, the formula is great and allows for multi-layering without clumping. 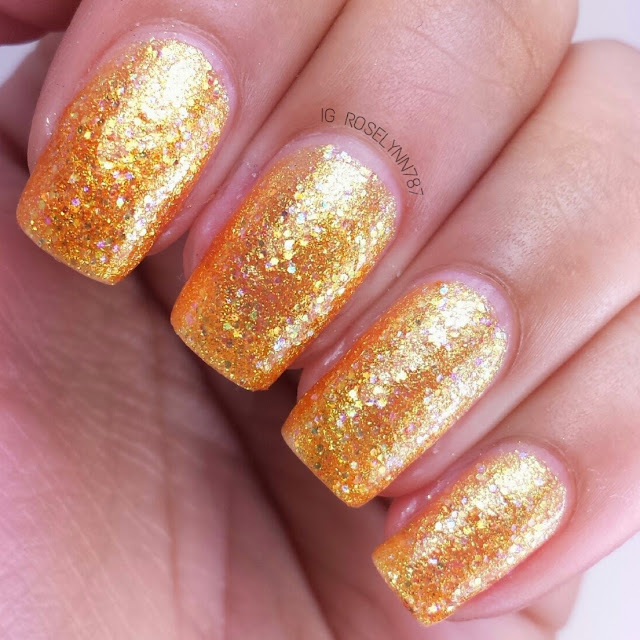 Stassi is a dark lemon green holographic polish with gold shimmer touch. I'd like to apologize for the main swatch photos being different than the other ones. I accidentally deleted the correct pose and left this one instead. Still you can grasp a great feel for this beauties color. I love the lemon color for Stassi and I can definitely see myself using it for a lot of nail art. Swatched over a clear base coat, used four thin coats, and sealed with a fast-drying topcoat. Out of all the polishes in this collection, this is definitely the sheerest. I had to use at least four coats to achieve full opacity. Because of this, I suggest letting layers dry a little between coats for a better application. 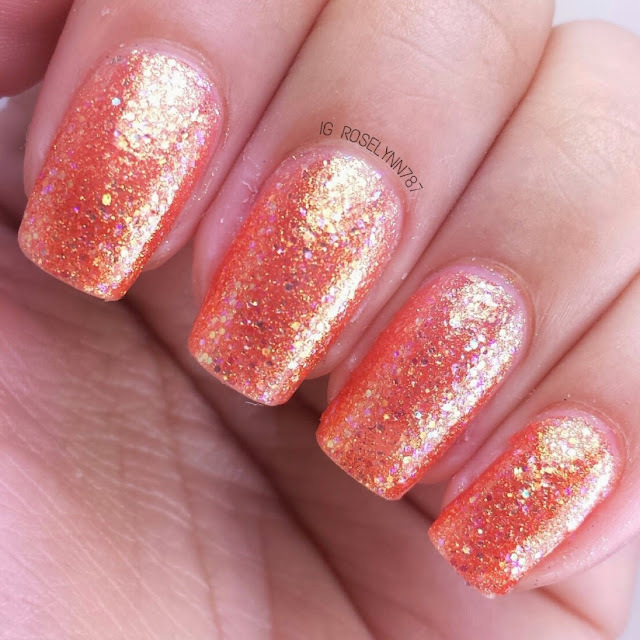 Jesy is a sassy coral holographic orange polish infused with a golden shimmer. So vibrant! When I first saw this collection I became instantly excited about this coral pretty. You don't see a lot of corals done right and this one here takes the cake. Perfect for the summer parties to come! Swatched over a clear base, used two thin coats, and sealed with a fast-drying topcoat. 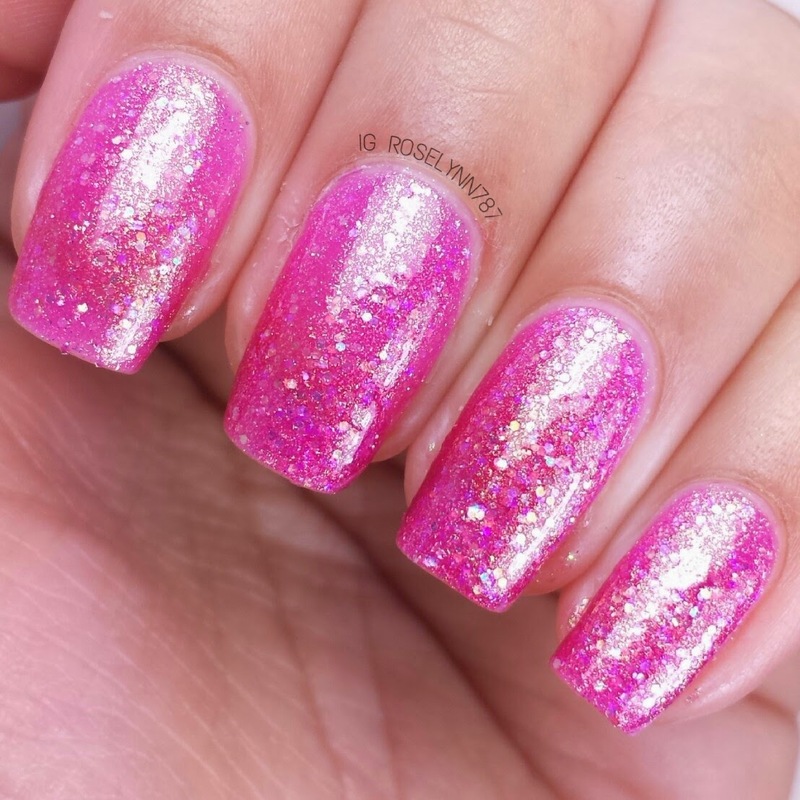 I only needed two coats to achieve full opacity with this one. Formula just as excellent and hassle-free as the rest. 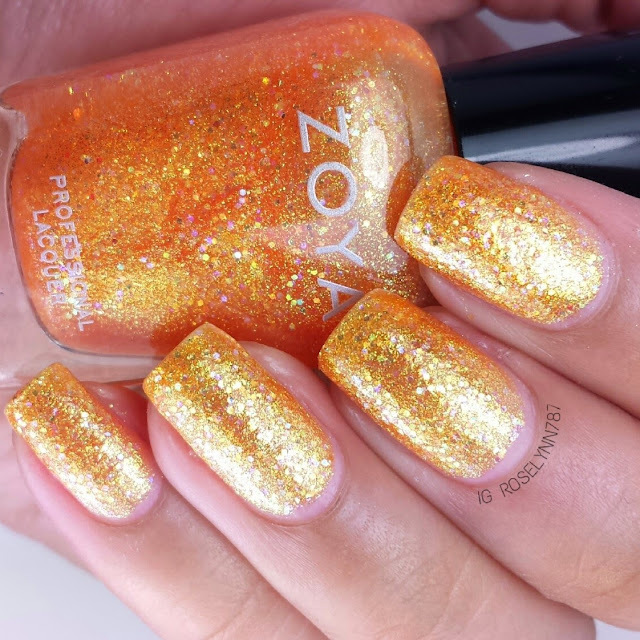 Last but not least we have Alma, a cute golden holographic peach polish with a metallic touch. I had a hard time deciding whether this beauty was orange or yellow. On my skin-tone it definitely looks more of a peach, perfect mixture of both shades. Swatched over a clear base coat, used two thin coats, and sealed with a fast-drying topcoat. Sheer in one coat, I felt like I only needed to add a second for full opacity. Same consistency as all the rest, easy to apply, and an all around great formula. Overall I am absolutely in love with this entire collection and definitely recommend you guys trying them out for yourself. I've described these as holographic polishes. Don't get confused though, this is not the typical holographic finish. These polishes all have the same exclusive liquid-metal holographic jelly formula. Excellent formula for each and every one. Well done Zoya! 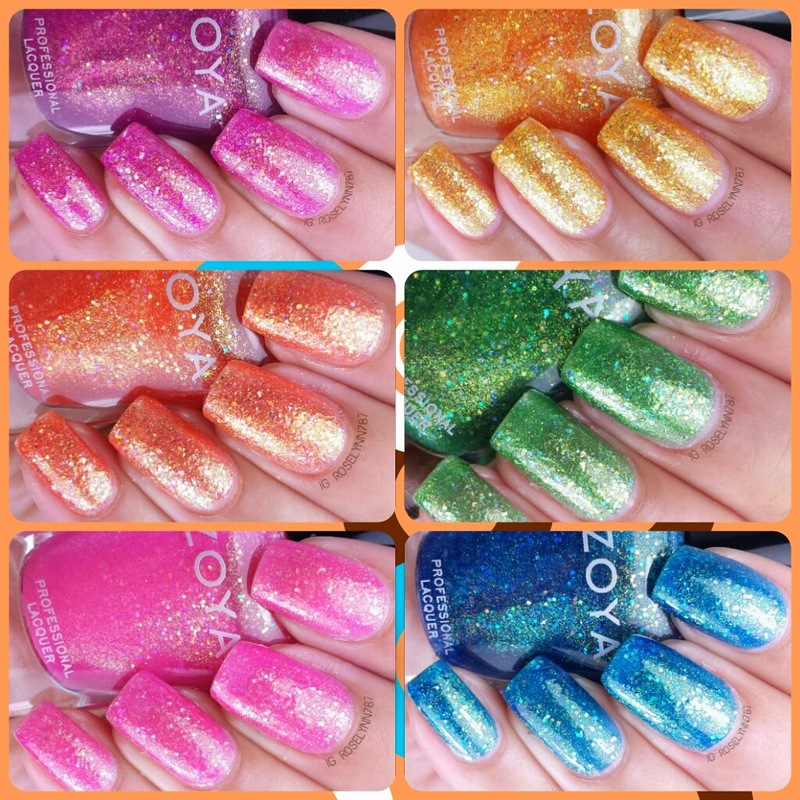 The Zoya Summer 2014 Bubbly Collection is available for Order at Zoya.com. Each polish in this collection will retail for $9 each. Don't miss out on your chance to grab these. Let me know down in the comments, which one is your favorite? 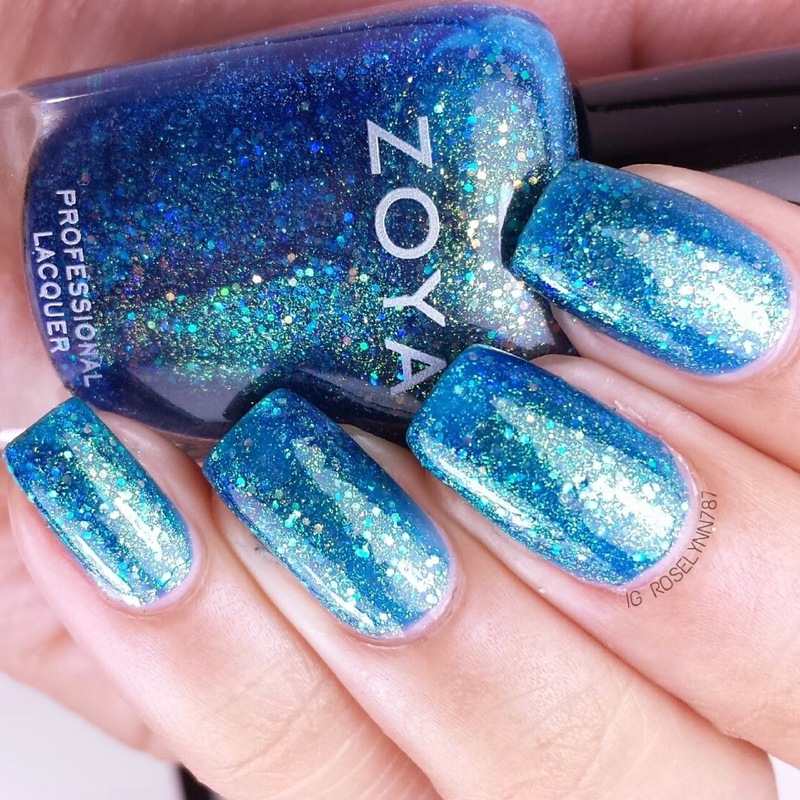 Such a beautiful summer collection from Zoya! I don't have any nail polishes from them but they all look ABSOLUTELY beautiful! Need to get my hands on them!